Yes, vegetarian chicken stock. It’s a thing. And I’ve called for it in a few recipes—my Vegetarian Chicken Noodle Soup and Chickpeas and Dumplings, for example. I always use the store-bought variety, but the problem with this is that it’s not sold in most grocery stores, so I get a lot of readers asking me where to buy it, what they can use instead, etc. Well, you can use vegetable broth, but for me, the color of vegetable broth in a noodle soup is off-putting. I want that golden color of chicken broth, but I want it without the meat. I’ve spent a lot of time thinking about how to make a homemade vegetarian chicken stock and I finally have a recipe that’s worthy of posting here. 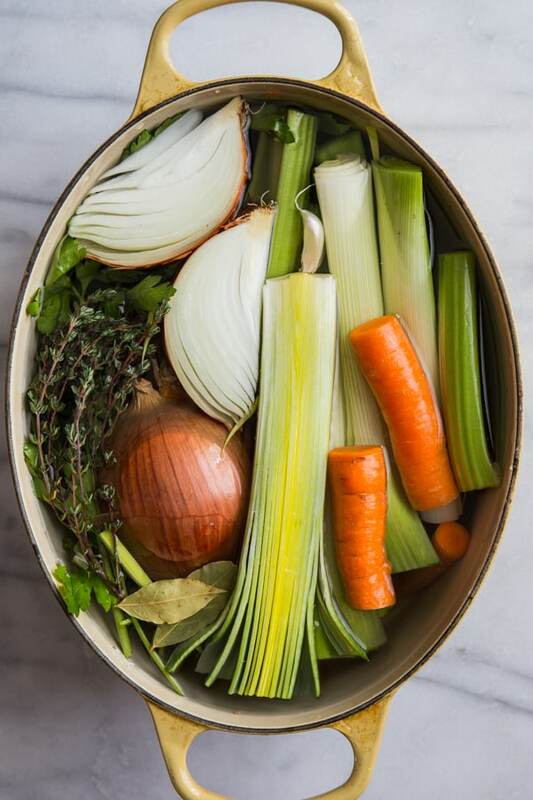 The labels on vegetarian chicken broth packaging are pretty vague, so they weren’t much help in figuring out how to make it, so I started by using the vegetables and seasonings that are typically used in chicken stock—onion, carrots, celery, garlic, leeks, fresh herbs and peppercorns. That gave me a good base, but then I had two problems to solve: how to give the broth that golden color I was looking for and how to get it to taste like chicken. I knew the color in packaged chicken (and faux chicken) broths didn’t come from the chicken itself. I suspected it was from turmeric. After a lot of label reading, I found a carton of chicken broth at Fresh Market that listed turmeric extract—victory! I knew it! Not having turmeric extract on hand, I added a small amount of turmeric to my recipe. It’s enough to add color without adding a strong flavor. That was the easy part; the hard part was figuring out the flavor. I found out that commercial vegetarian chicken broths often use certain types of yeast for flavor. I considered going that route, but the entire point of this recipe was making a broth that didn’t require any special ingredients—because if you need to schlepp to Whole Foods for nutritional yeast, you might as well just pick up a carton of broth while you’re there. So I went with a staple I keep on hand for adding a subtle meaty flavor to vegetarian remakes like this: smoked paprika. I remembered that when my grandma made chicken and turkey stock, it always had a vaguely smoky flavor—I’m guessing it was because she’d use leftover meat to make it. It wasn’t an overt smokiness, not one that dominates as smoky flavors sometimes do, but one that co-existed nicely with the herbs and vegetables she used. That’s exactly what the smoked paprika does here. Does this stock taste exactly like chicken stock? Definitely not! But after using it in a variety of recipes over the past month, I feel confident in saying that it’s a pretty good homemade vegetarian stand-in for it. A homemade alternative to store-bought vegetarian chicken stock. Combine all of the ingredients through the water in a large stockpot over high heat. Bring to a boil, then reduce heat to low. Simmer for 2 hours, then stir in the turmeric and paprika. Let the stock cool. Once cooled, set a fine mesh strainer over a large bowl or a second stockpot. Pour the stock through the strainer, then use the back of a wooden spoon to mash the vegetables to release as much liquid as possible. Discard the solids. If you’re making broth, add salt to taste. Use the stock immediately or freeze in airtight plastic containers or freezer bags. Brilliant idea, Kiersten! I love that you added a little smoky flavor. It sounds perfect!! I was confused with the post name as I thought it was a vegetable chicken stock, but it’s really a vegetarian Chik’n stock ..
As I was picking up vegetable broth at the store today, I was thinking “why not make broth at home?” And few hours later, I see your recipe.. Timing can’t be any better.. Thank you & pinned! This is something I didn’t even know I wanted until I saw it here! What a great idea–this must be incredibly versatile in terms of all the different kinds of soups, stews, and chili preparations in which you could use it. What a pretty color this stock has! The smokiness would def give it the richness/chickeny flavor you’d be looking for. Great idea. That is vegetable stock. It’s not vegetarian chicken stock, there is no such thing. Yeah, I was expecting some addition to make it taste chicken-y but this is just vegetable stock. You’re right, this is VEGETABLE stock. Anything Vegetarian means there is NO animal meat products in the food. I was raised on a vegetarian diet for many years when I was a kid. I know what vegetarian is. One thing I really need to start doing is making my own veggie broth. I really feel so stupid whenever I buy a carton at the store. I never thought to question what the difference was between the vegetarian broth and the vegetarian chicken broth was…but now I totally get it! Thats a great idea, i love how you make it meatless. Kingdom produced by company called Marigold and it is called Savoury Vegan Engiveta Yeast Flakes. Same thing as nutritional yeast just different name. It can readily be bought off the shelf in a large chain of “health food stores” (H&B) or easily found online. Hope that helps!